Swan Valley Connections' field program campus is located in Montana's Swan Valley, the heart of the Crown of the Continent, and is situated between the Bob Marshall Wilderness and the Mission Mountains Wilderness, about 100 miles south of Glacier National Park. The Swan is a forested valley with thousands of lakes, ponds, wetlands, abundant wildlife and spectacular scenery. The community of Condon, Montana, is integral to Swan Valley Connections’ education programs, hosting and mentoring students throughout the year. Historically, the Swan Valley was carved up into a checkerboard pattern of land ownership, a relic of the 1864 federal land grants to railroad companies. Swan Valley Connections helped lead the effort to transfer those corporate lands into public ownership and and has secured a long term program of restoration and sustainable timber harvest in the valley. Swan Valley Connections is located approximately 90 miles north of Missoula and 70 miles south of Kalispell. Our field program facility is a historic turn-of-the-century homestead. Our campus is located just off of Highway 83. At Mile Marker 47 turn west onto Cold Creek Road and drive 3/4 mile. Turn right (north) onto Ed Road and drive a 1/2 mile. Proceed through a gate and merge right. This road dead-ends at the Barn and Cookhouse. "The Barn" was built in the 1930's and serves as SVC's classroom and student bunkhouse. Our living room and classroom. Landscape and Livelihood students learn forest ecology in our first floor classroom before heading into the field. The library of relevant field guides, textbooks, and skulls. 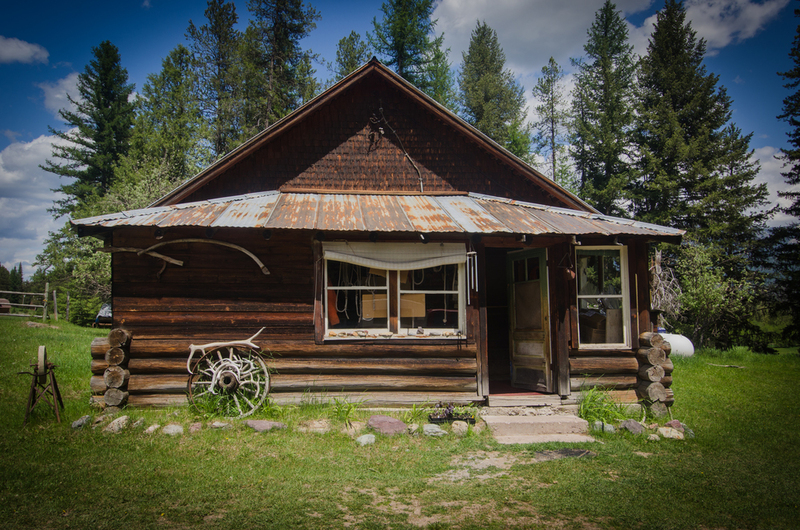 The original Beck Homestead Cabin still exists on our campus. Wildlife in the West students meet with a state biologist on our campus before helping with a wildlife survey. Students and interns live in The Barn and experience the Swan Valley's classroom each day. While the homestead's original Barn has no running water, the adjacent wash house has toilets, showers and big ol' porch for drying gear and watching the sunrise. Student bunkrooms and a second library are located on the second floor of The Barn.